Have you ever been in a busy coffee shop that didn’t take customer names, but instead the baristas called out the orders once they were made? When you’re one of just a few customers, or if your drink is very distinct from others, then there isn’t much of a problem figuring out which one is yours. Now, consider a situation you might have experienced before, where several different drink orders in similar cups were made at the same time. In a rush to acquire your constitutionally required caffeine dosage, how do you quickly determine which drink is yours? What if you mistakenly pick up the wrong order? If your drink doesn’t stand out, and you’re more uncertain about which one is yours, do you go for a specific cup more quickly or slowly than you otherwise would? How much of a tragedy would it be for you, or another customer, if you didn’t get what you expected? This cafe conundrum is a prime example of an everyday decision for a lot of people who want to grab their brew and get back to work. More specifically, it’s a kind of risky spatial decision. The spatial part of the decision is straightforward: Where is the cup that I should grab? But what makes this decision a risky one is that as more similar orders are ready at the same time, your chances of grabbing the correct cup decreases, i.e., the risk of picking the wrong cup increases. 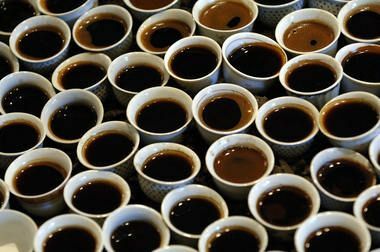 Uncertainty is also an important factor here, because not only does risk increase when more cups are present, but you’ll also be less sure of which one belongs to you when you have to make a choice from a larger number of cups. So, what exactly happens when a person tries to make a risky spatial decision under increasing amounts of uncertainty? This is the sort of question I addressed with a former labmate, Rory Flemming (Twitter: @DontRoryAboutIt), and my PhD advisor, Tim Verstynen (Twitter: @tdverstynen) in a recently published study “Sensory uncertainty impacts avoidance during spatial decisions”, now in Experimental Brain Research (Jarbo, Flemming, & Verstynen, 2017). How we decided to address this question was strongly inspired by some earlier theories of sensorimotor integration, namely the maximum expected gain framework. Julia Trommershäuser developed and put forth this theory through a series of studies exploring how people were able to combine estimates of external spatial information (e.g., the visual target stimuli you see) and internal motor variability (e.g., how good your aim is) to execute goal-directed movements (Trommershäuser, 2009; Trommershäuser, Maloney, & Landy, 2003, 2008). In her experiments, she asked people to make rapid reaches to a touchscreen monitor in order to touch a green target circle that was overlapped by a red non-target circle (see figure below). The dots in the image below represent the points where a participant touched over multiple trials of the task. On some trials, reaches that landed in the red non-target circle were penalized and, with this experimental manipulation, Trommershäuser and her colleagues observed that while people tried to hit the green target circle, they also biased their reaches away from the penalty regions of the red circle that overlapped the target. The findings served as a basis for using a mathematical model proposed in the maximum expected gain framework to explain how people account for their estimates of the visual stimulus as well as their aiming ability to make optimal movement decisions. In the last 15 years, other researchers like Heather Neyedli (Neyedli & LeBlanc, 2017; Neyedli & Welsh, 2013) and Megan O’Brien and Alaa Ahmed (O’Brien & Ahmed, 2015, 2016) have done work to build off the maximum expected gain model to get a better understanding of how contextual information about penalties can influence how, and even if, people make optimal decisions about their visually guided actions. Continuing with this line of work, we tweaked our visual stimuli to explore some untested predictions of the maximum expected gain model. In particular, we asked whether increasing uncertainty in the location of a spatial target increased how much people biased their movements to avoid potential losses. Basically, we wanted to see how people’s behavior changed on a risky decision when we made it harder for them to be sure of the best choice. This could be very important for understanding how we can improve people’s choices on high stakes decisions when the best option is really unclear. In our recently published study (Jarbo, Flemming, & Verstynen, 2017), we used an experimental task called Danger Zone where 20 healthy adult participants used a computer mouse to select locations within a visual target. The target was represented by a cloud of white dots that briefly appeared for 300 milliseconds in a random location on a computer screen, then disappeared. A non-target, the Danger Zone, represented by a cloud of red dots also appeared with the target so that the center of each dot cloud was exactly 50 pixels apart on every trial. Participants had an unlimited amount of time to estimate and click the location of the center of the target dots in order to score the maximum amount of points on a trial. 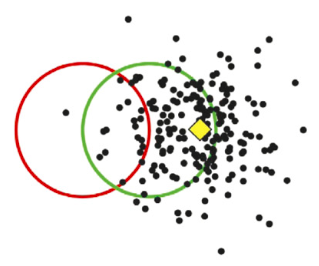 On some trials, the target dots were closer together (low variance) or spread farther apart (high variance) on others. We also had some penalty trials where points were lost based on how close a selection was to the center of the Danger Zone. Importantly, these trial conditions allowed us to experimentally control the amount of uncertainty (i.e., variance) in estimates of the target’s center, which hadn’t been manipulated in previous work since circles were used instead of dot clouds. By increasing the spread of dots in the high variance conditions, a person's guess as to the exact location of the center of the target dot cloud is more uncertain than in the low variance conditions. Similar to past studies, we controlled the expected gain (i.e., points awarded) for selections on trials with or without penalty conditions. Using these experimental manipulations together, we were able to use our Danger Zone task to test whether people changed their selection behavior when they thought their potential for gain or loss on a trial was more or less risky, or uncertain. By recording both where and how quickly our participants made their selections on each trial, we got a sense for how much they tried to maximize their score and, critically, how much they tried to minimize losses. As predicted by the maximum expected gain model, people picked a LOT further away from the Danger Zone in penalty conditions. Additionally, in a previously untested hypothesis, we found that people also avoided the Danger Zone in high variance conditions when the target center was harder to locate. In fact, people selected farthest away from the Danger Zone and took the longest time before starting to move (i.e., had the slowest reaction times) on trials in high variance conditions with penalty. Overall, our results strongly suggested that when we are less sure about the expected outcome of a decision, we slow down and bias our actions in order to avoid a potential loss. Next time you think about making a quick trip to a crowded cafe and want to grab the right order and save some time, you ought to steer clear of that Danger Zone!!! Now that we have some evidence that people go to greater lengths to avoid losses during spatial decisions as the perceived risk increases with uncertainty, we can take this work a bit further. For instance, we can start to ask questions about how people change their decision-making behavior when the kinds of loss changes while the degrees of risk and uncertainty stay the same. In my current dissertation work with my colleague, David Colaço in History and Philosophy of Science at the University of Pittsburgh, we are trying to figure out how the contextual framing of loss on a risky spatial decision impacts how much people change their behavior to avoid different types of losses. In particular, we asked people to do a task just like Danger Zone, but told them that the targets and non-targets represent the positions of either enemies, allies, or trees. Their goals were to execute a drone strike on enemies or deliver ammunition to allies, which allows us to explore whether or not how much someone thinks they are doing a potentially harmful action changes the way they make risky spatial decisions. With this project, we hope to bridge moral philosophy and cognitive psychology to gain some insight as to how moral reasoning and judgments about a perceived moral dilemma, like causing ally casualties on a drone strike, impacts our decision-making behaviors. Older PostWhy I love brain imaging.